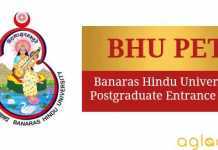 The Banaras Hindu University has released the BHU UET 2019 Application Form in online mode at bhuonline.in. Candidates who want to apply for Undergraduate Courses at the University must check the eligibility. Candidates could fill BHU UET Application Form 2019 till March 16, 2019, but the already registered candidates are given chance to submit their application from April 07 to 08, 2019. In order to fill BHU UET 2019 Application Form, candidates are required to candidates need to register themselves first. BHU UET 2019 Application Fee is Rs 600 (For General) and Rs. 300 (For SC / ST / PwD). 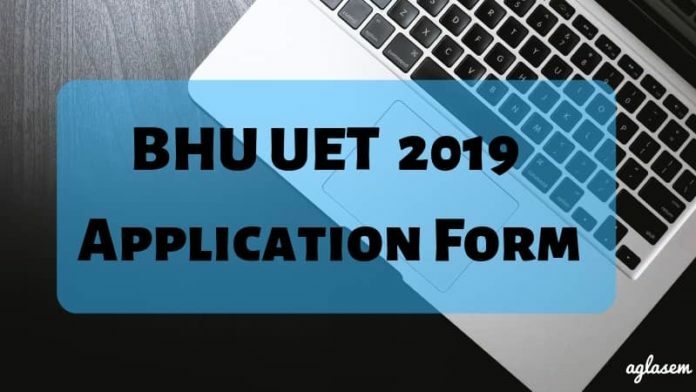 To gather all the information about BHU UET 2019 Application Form go through this article, be it, its process to apply, image specifications etc. Apply Online: Click here to fill the BHU UET 2019 Application Form. Aspirants interested in filling up the BHU UET 2019 Application form must pay the prescribed fee to complete the application process. The Application fee given in the table below is as per the last year information. As soon as the latest notification is released, details will be updated here. Candidates can check the expected application fee for BHU UET Application Form given in the table below. In case a candidate fills up application form for more than one course under BHU UET 2019 Entrance Exam, the Application Fee payable for each application after first application shall be charged as per reduced rates given below. Mode of Payment: Candidates will be able to do the fee payment through Net Banking/ Credit card/Debit card or also through Challan payment. Candidates are advised to keep the following documents handy while filling up the BHU UET 2019 Application Form. Access to Online Payment facilities such as Debit Card / Credit / Net Banking or Challan if you have to pay through Cash. Candidates can follow the steps listed below to fill the BHU UET 2019 Application Form. Step-1 Registration: Students are first required to register themselves by clicking on the link of “Apply for Admission”. 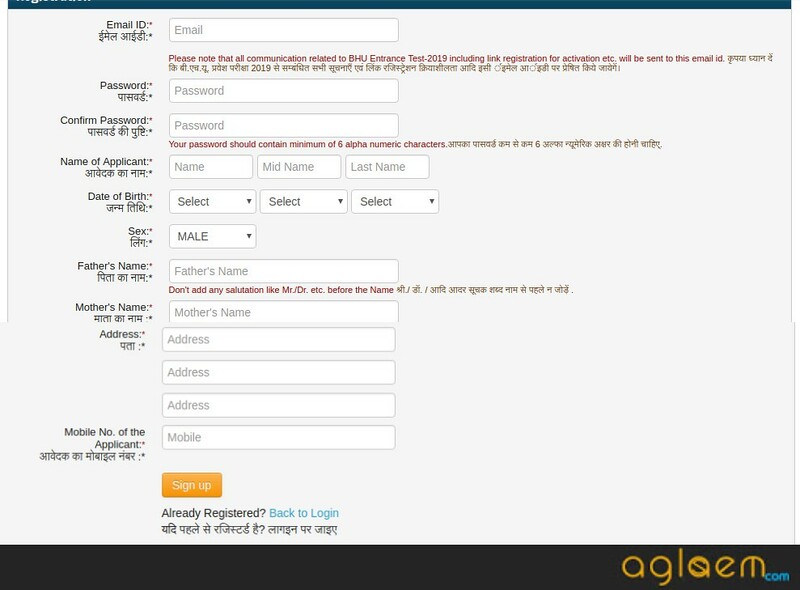 Then, click on the “Register Yourself” and enter your details like E-mail ID, password, personal details. Next, click the “signup” button. After the registration, candidates will be sent a validation e-mail on their registered e-mail id. Click on that link and enter your activation code to start filling the application form further. 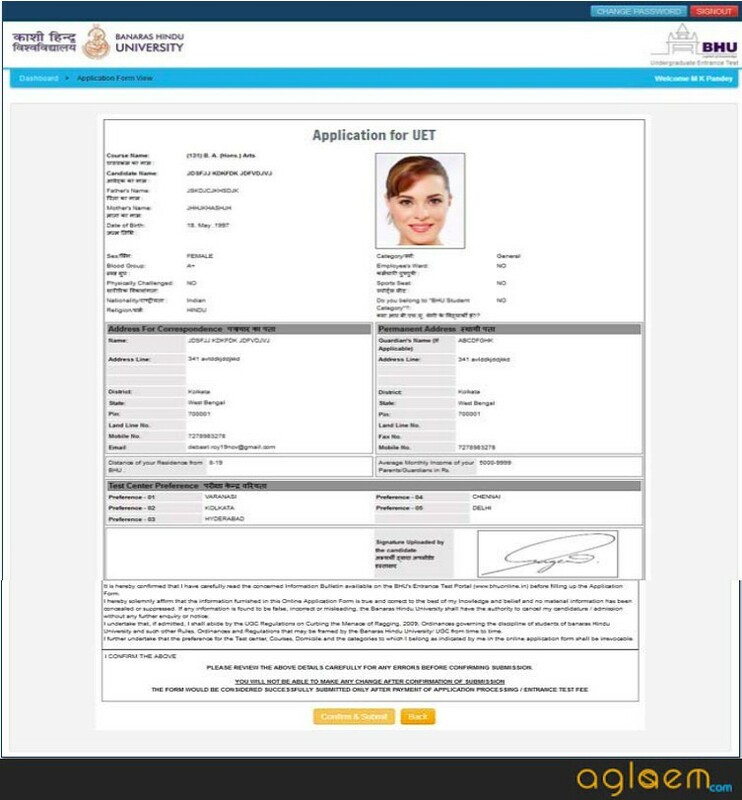 In this section, candidates are required to fill their identity details. Make sure you enter every detail correctly as specifies in the documents. Step-2 Course selection: Now, candidates will have to select the course for which they wish to apply and then click on the “Check eligibility” option to get to know whether they are fulfilling the eligibility criteria for that specific course or not. Step-3 Check Eligibility and Add Course: Now, after checking the eligibility criteria click on the “Add Course” button. Step-4 Start filling up the necessary details: After the selection of the course, the status of all the four will show incomplete. Candidates will have to click on the Application details on the left panel and start to fill up the relevant details. Step-5 Fill up The Personal Details: Candidates have to fill the details like Personal details, Complete address and communication details as given in the image below. 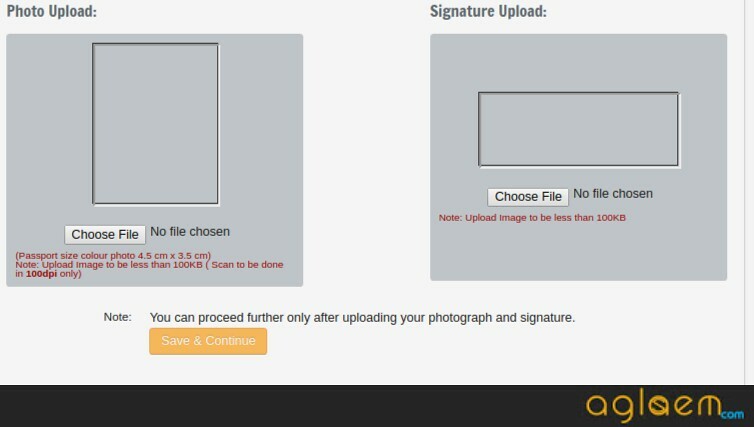 Step-7 Upload the required documents: Upload your Scanned Photograph and Signature as per the specifications and then click on preview before confirmation to see the uploaded picture and signature before proceeding further. Step-8 Review your Application Form: After filling up all the details, review your application form to see if all the details filled by the candidate is correct as per their knowledge. Then, click on “Confirm and submit”. Step-9 Mode of payment: Candidates will have to choose the application for which they want to do the fee payment. Now, choose the mode of payment online mode or through Challan. Step-10 If the candidate chooses the Online mode: After clicking on the “Continue for Online Payment” you will be redirected to the review before the online payment. Step-11 If the candidate does the fee payment by Challan: When a candidate chooses the option of Challan payment through HDFCBank then the following image will be displayed on the screen. Step-12 Pay The Prescribed Fee: After clicking on the “generate and Print Challan” the details of the applicant will appear on the screen along with the amount to be paid. Now, click on the “Pay Now and submit application”. Note: Candidates must retain a copy of the submitted application form with them as it will be required in the further admission process. Now, to fill the Application Form candidates need to upload the documents in the Application Form in a specified format. Check the details given below in order to know the file size, format etc. If the fee has been paid via e – challan by depositing cash in the bank then the candidates must contact the concerned bank immediately to update his / her fee status on the website. If the fee is paid through credit / debit card and the status is not Ok, then it means the transaction is cancelled and the amount is going to be refunded to the concerned credit / debit card within 7 – 10 days. 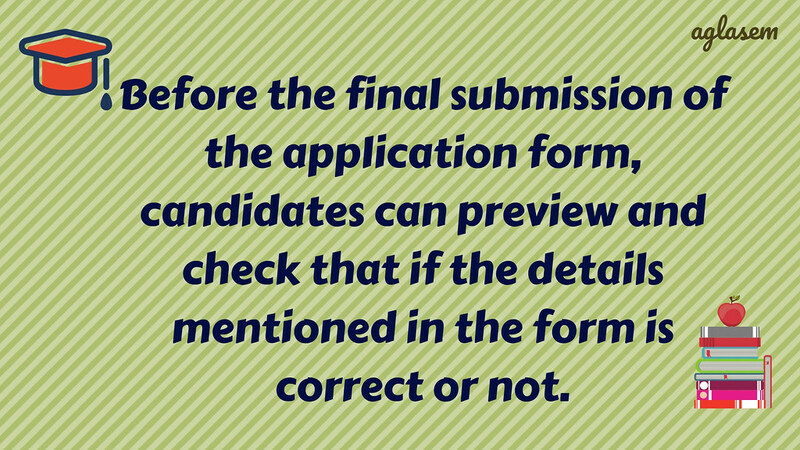 After that the candidate has to pay the fee once again and check the OK status within the last date for submission of online application form. Candidates who will submit their application form on time will be issued admit card. 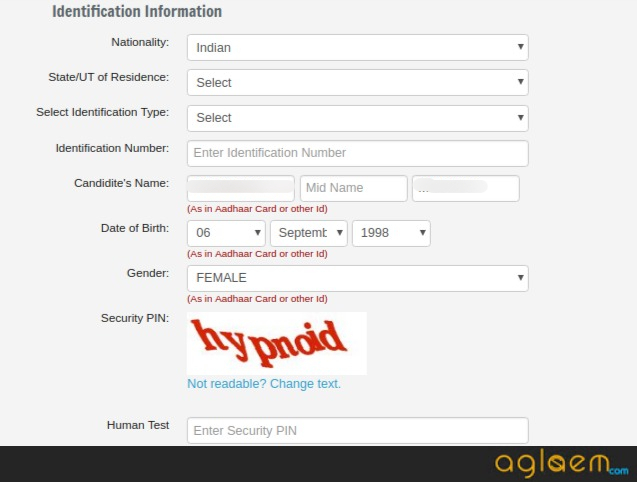 The admit card is going to made available in online mode on the University website. It can be downloaded from BHU Entrance Test Portal which is www.bhuonline.in. Candidates can download the same one week before the examination. Candidates must note that the admit card will not be sent to them through post/courier. Candidates are advised to carry the hall ticket on the day of examination as they will not be allowed to enter the test center without a valid admit card in any case. 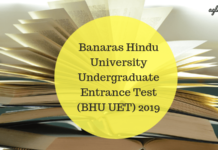 BHU Undergraduate Entrance Test (UET) is conducted by Banaras Hindu University to take admission into undergraduate, professional, other professional and vocational programs. BHU UET is a national level entrance examination which is going to be conducted in two different modes i.e. Computer Based Test and Pen – Paper Test. There are going to be different cities for both the tests. 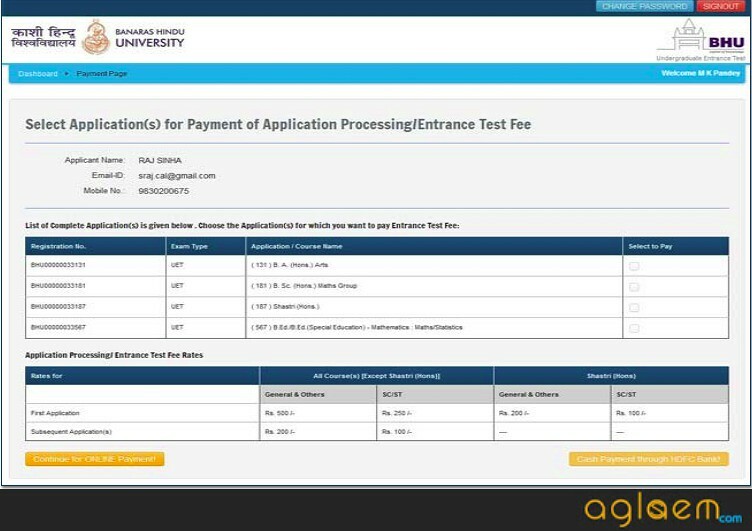 It is only after the payment of the application fee candidates can download their admit card. The examination is scheduled to be conducted from May 12 – 16, 2019 and it is going to be conducted in two time slots i.e. in the morning and in the afternoon. Candidates are even required to appear for the practical tests for some examination and have to give the Physical Fitness Test for some examination. A major change Banaras Hindu University has implemented from this year is that now the examination will be conducted in both Computer-Based and Pen – Paper Based Test. There is requirements of spacimes of affidavit which is required at the time of entrance exam of BPEd. BHU UET application form 2019 is available now. You can apply from the link given above. Bhu ka bvsc ki ( from complete show) nahi kr rhai h tell me what I do….. Wait for sometime there may be a problem in the server. B.Com me admission ka apply ka date kab hai. Apply date feb se suru thi aur march tk thi.